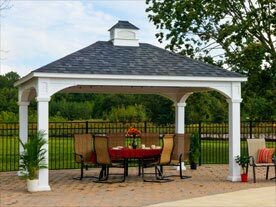 Countryside Gazebos Canada Ltd has added some new low maintenance Vinyl Pavilion designs for you to choose. Please contact us (905-841-0612 or 1-888-761-0242) for pricing and sizes. We have an extensive line-up of attractive Vinyl Pavilions which provide protection from rain and sun. 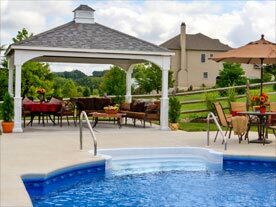 All our Pavilions have optional curtains that can be used for added protection from the elements. 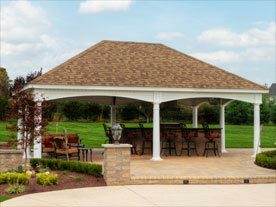 All Vinyl Pavilions are manufactured from high quality Vinyl, which is both color fast and non-brittle, to guarantee longevity. 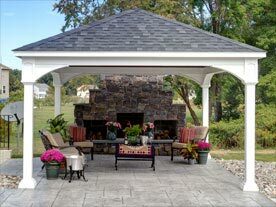 You will have the opportunity to choose from a variety of styles: Traditional, Hampton and Custom. We provide a very attractive stained 1x6 V-Groove, Tongue and Groove sheeting to provide a stunning ceiling! 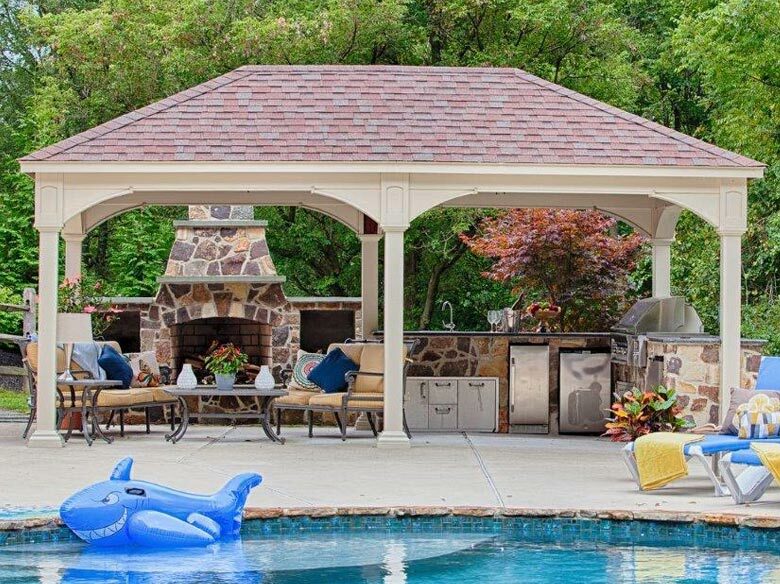 A great way to create a beautiful outdoor space with a kitchen and dinning area to enjoy with family and friends! 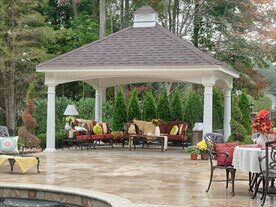 Why Choose a Pavilion Kit over a Custom Built Pavilion? 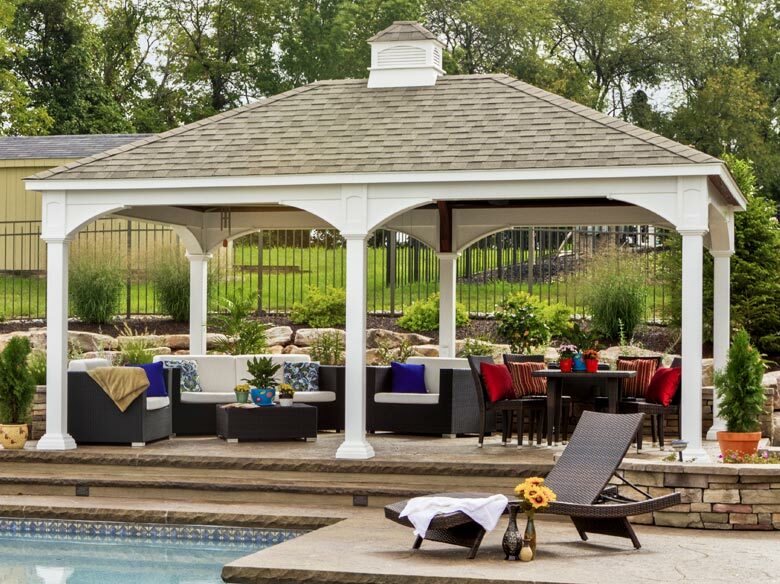 All our Vinyl Pavilions are delivered in convenient, easy to assemble kits with full instructions for the handy person who chooses to complete the Pavilion installation themselves. 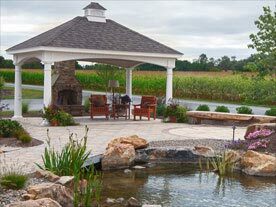 This makes the road to owning the perfect Pavilion even easier. 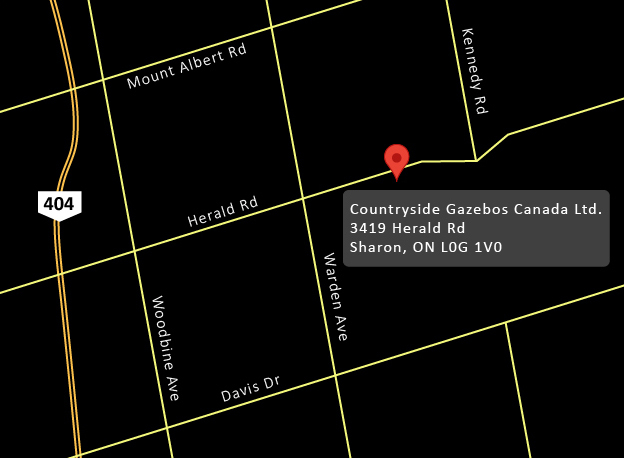 Countryside Gazebos Canada Ltd. can also provide you with professionally trained crews when needed.